Well, I'm predicting an away win! Carrol to return and Vardy to be sent off. 2-2 just like old times. I had the misfortune to be stood next to them last time. Their title win was the stuff of fairytales but then again, so are they. It will be our first encounter this season with inflatable clappers. a few changes for this one. hopefully obiang returns or we have lost the midfield. would drop Anderson for this one as we need players who will try and a goal threat. be nice to get a clean sheet but cant see it at the moment. 1-1 Hernandez with a welcome goal. Respect the point. hammerman11 wrote: a few changes for this one. hopefully obiang returns or we have lost the midfield. No to Cresswell. He needs to be sent back to a Championship team in January. No idea how to defend and so wasteful when he gets upfield. Lost patience with him. 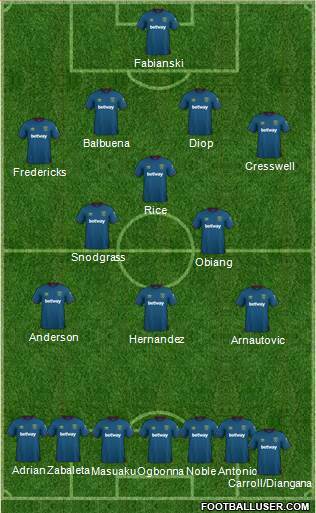 Subs: Adrian, Fredericks, Ogbonna, Masuaku, Snodgrass/Obiang, Anderson, Hernandez. Yes, I propose a match on the sub's bench for our record signing. Yes, I think that my eleven has something of a barebones appearance to it. That's how we should start the match, with definite plans to change it up in the second half. Do we now have 5 on the long-term injured list? (Lanzini, Reid, Sanchez, Wilshere, Yarmolenko). Oh, plus Andy Glass. No, I don't expect more than a point, but I also feel that we might secure a clean sheet. Subs: Adrian, Fredericks, Ogbonna, Noble, Diangana, Carroll, Hernandez. They're a very good team but we came away with a 0-2 victory last season helped by that magnificent volley from the Captain . They're a team that like to catch you on the break so pretty similar to ourselves , hopefully it'll be a good game and we come away with all three points . Probably our best away record v Leicester more wins than defeats last 20yrs ! The only chance we've got of scoring is from a penalty. I say just play as many balls into feet to Arnie and get him to dive all over the place. Get 1-0 up from the spot and then just park the bus and hang on for dear life. Job done. We played them at a good time last season. They had put up the deck chairs and were woeful. We played well and it was one of the best away atmospheres I have experienced in a while. I wish we had gone for James Maddison. Half the prices of Felipe and has taken to the Prem like a duck to water. Stepney wrote: The only chance we've got of scoring is from a penalty. I say just play as many balls into feet to Arnie and get him to dive all over the place. Get 1-0 up from the spot and then just park the bus and hang on for dear life. Job done. I’d rather lose 5-0 than win like that.